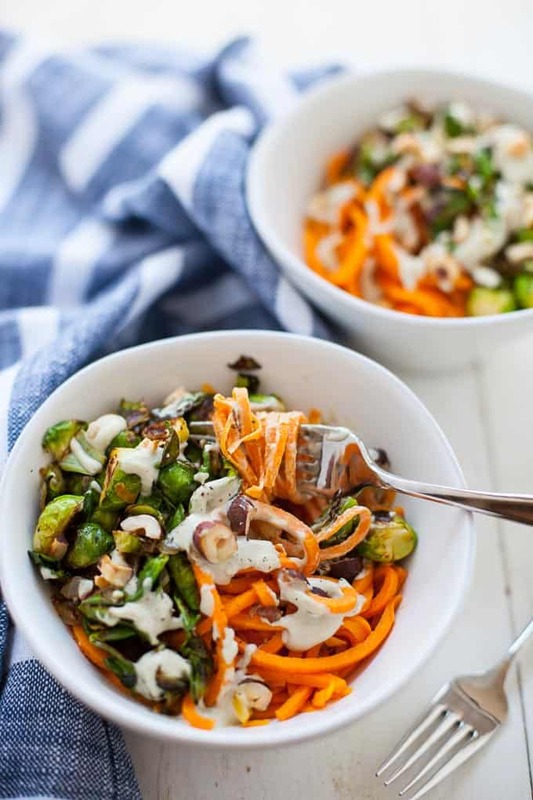 A comforting, creamy and hearty plant-based meal, these sweet potato noodles with sage cashew cream sauce taste too good to be good for you (but they’re great for you!) Anyone else need a comforting meal after this Election season?! I’m writing this the morning after the election and feeling the aftermath. And I need all the comforting, grounding things I can get my hands on today, including this grounding bowl of plant-based comfort food. I also need to get myself back on track today after eating one too many cookies and sipping one too many cocktails last night watching the coverage. 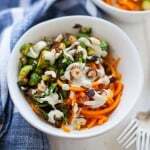 This healthy sweet potato noodle bowl will do just the trick. This is my first spiralized recipe I’m posting on the blog and I know I’m like two years too late to the party but I finally made it and Imma do a happy spiralized dance anyway. I got a spiralizer from my dear Mom for my bridal shower after she noticed I wrote a blog post where I mentioned I couldn’t spiralize anything (the perks of having your Mom as your #1 blog fan). We’ve been spiralizing a few veggies here and there since – zucchini in the summer and now onto sweet potatoes and other root veggies for the fall. I wasn’t totally sold on the zoodles craze. I mean they were good but not that good. But I feel totally different about sweet potato noodles (SPOODLES?!) Maybe because I feel like they have a little bit more substance to them and am craving all the grounding foods now as the weather gets colder and colder. 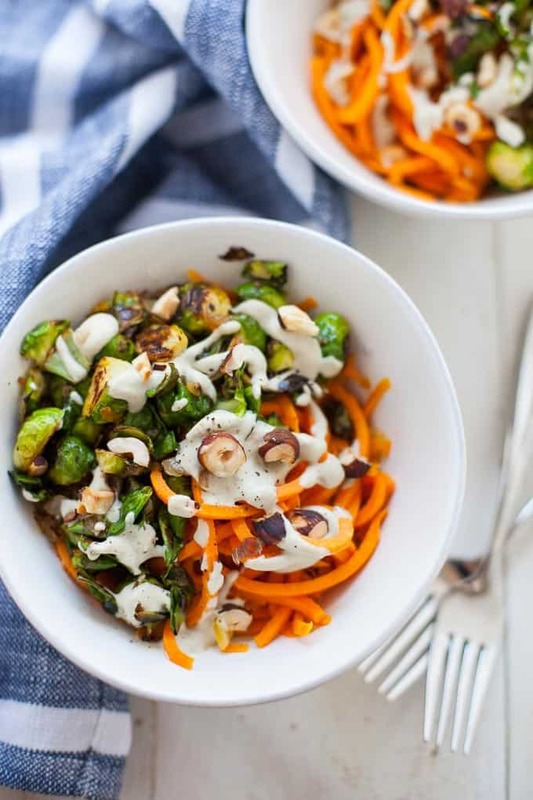 These SPOODLES (LOL) are tossed with crispy roasted Brussels sprouts, toasted hazelnuts for crunch and nuttiness, and a deliciously creamy, indulgent tasting sage cashew cream sauce. I’ve been loving these creamy cashew sauces lately (like the one I just made for my Fall Harvest Buddha Bowl) because they taste rich and comforting but don’t leave me with a stomachache like regular cream sauces do. Plus, they add an extra protein and fiber boost to your meal! 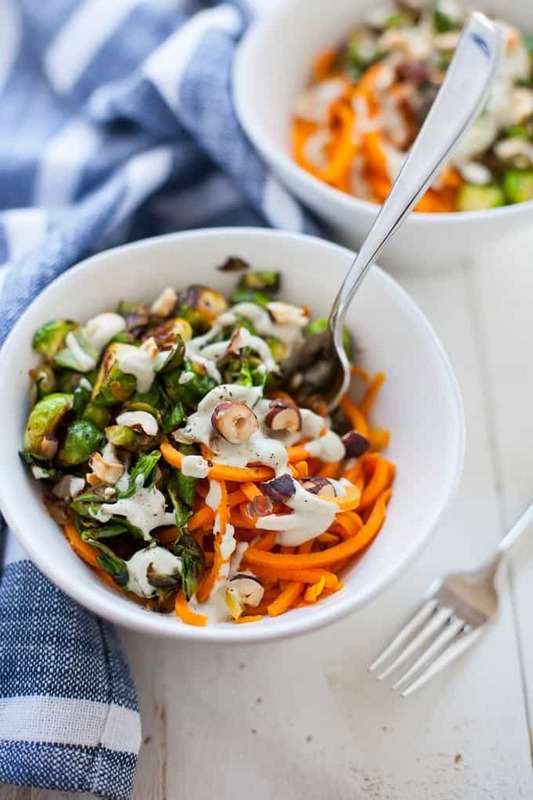 Not only is the bowl of spoodles packed with fiber and plant-based protein but it’s also high in vitamins A, C and folate thanks to the sweet potato and Brussels. If you’re looking for a gluten-free alternative to pasta, a dairy-free alternative to cream sauce or just want to find ways to add more veggies to your plate, this recipe is for you! Enjoy it on those weeknights when you need a little extra comfort in your evening. Also, this meal would be a delicious, healthier, plant-based side dish for your Thanksgiving lineup! Preheat oven to 400 degrees F. Toss Brussels with 1 tablespoon olive oil, 1/8 teaspoon salt and pepper on a parchment-lined baking sheet. Roast for 30-40 minutes or until tender and crispy. Using the medium blade on the spiralizer, spiralize the sweet potato. In a non-stick pan, heat olive oil over medium heat. Add onion and cook for 5-7 minutes or until translucent. Add spiralized sweet potato and saute for 5-7 minutes or until cooked through (but not until too soft that they begin to break apart). In a small saucepan, heat hazelnuts over medium-high heat and toast until fragrant and light brown. 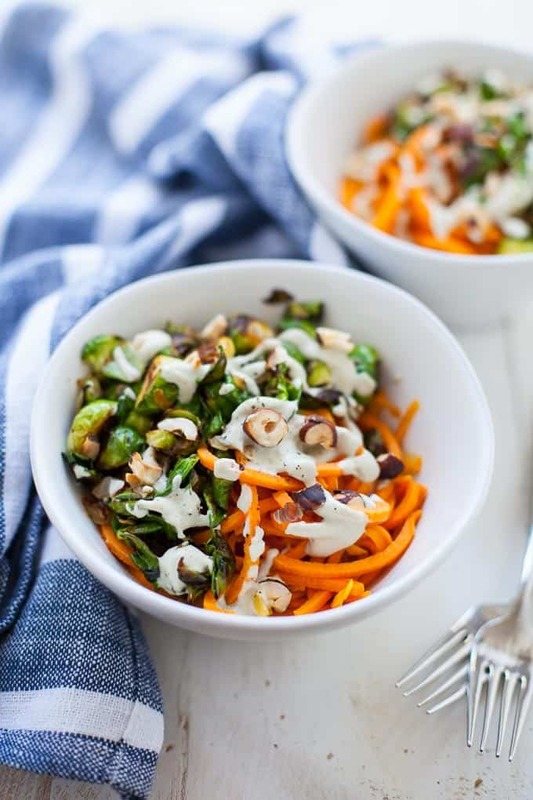 Divide sweet potato noodles between bowls and top with roasted Brussels sprouts, toasted hazelnuts and Sage Cashew Cream Sauce. 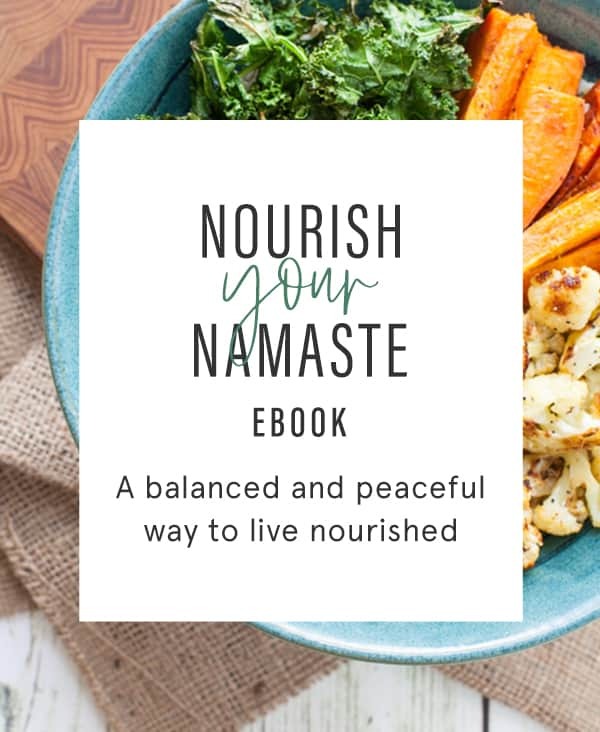 In a high speed blender or food processor, add soaked cashews, shallot, garlic, olive oil, almond milk, sage and salt and pulse until smooth and creamy. Drizzle over sweet potato noodles. This recipe makes enough sauce for 6-8 servings so feel free to double (or triple!) the sweet potato noodles or save for later use. Tell me, have you ever tried sweet potato noodles? This looks absolutely delicious! 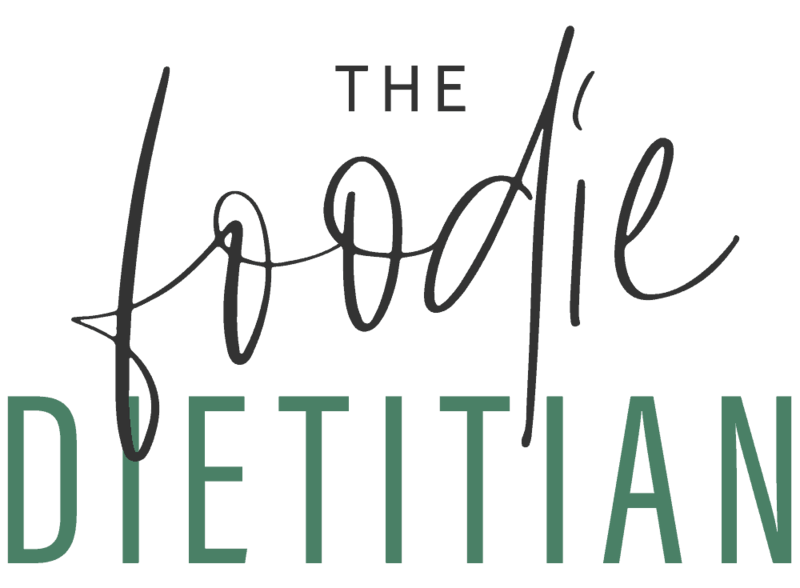 I’m loving cashew cream sauce lately…but need to use my spiralizer a little more! Thanks for the inspiration. Thanks, Maria! So great to meet you in-person yesterday! I have been wanting to experiment with sweet potato noodles for some time now! This looks like the perfect recipe to try out. Plus, what a perfect fall dinner! Thanks, Lauren! I hope you enjoy ’em! #1) Spoodles is a genius name for sweet potato noodles. LOVE it! 2) This sounds amazing! Even my 3 year old son gobbles up sweet potato noodles! We would all love this! Haha I’m glad you enjoyed Spoodles!! 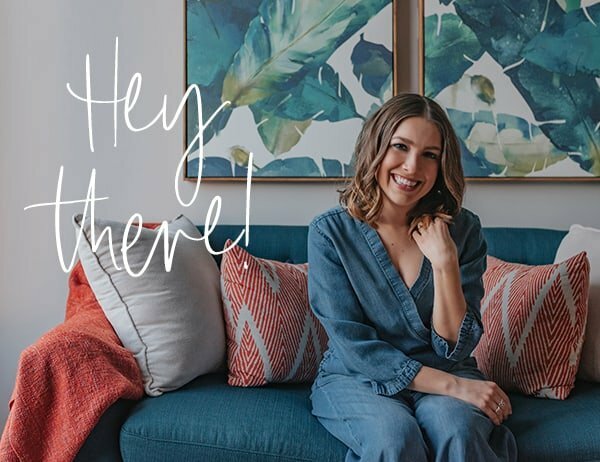 And I love that your 3 year old son likes sweet potato noodles – that’s awesome! I have been obsessed with sage lately! This looks delicious. I’m trying this for dinner tonight for me and my family! Yay! Let me know what you and your family thinks of the recipe! That cozy sauce sounds to die for!